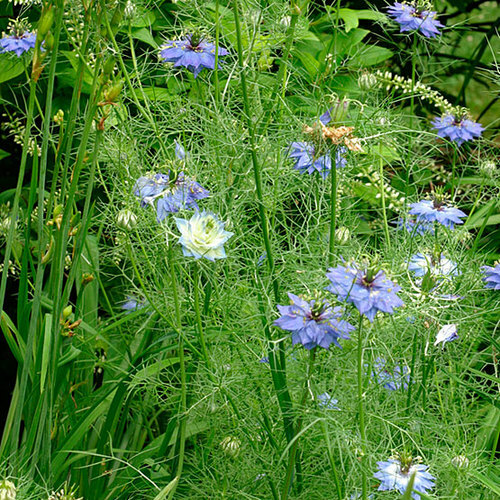 The genus Nigella is made up of 20 or so species of stiff, bushy annuals grown for their lacy foliage, delicate-looking flowers, and decorative seedheads. The summertime flowers are pink, blue, yellow, or white and have a collar of leaves surrounding the petals. The seed capsules can be dried for arrangements or left to break open to scatter their potential progeny. Use Nigella in an informal border or bed, a cottage garden, or a cut flower garden. Noteworthy CharacteristicsFeathery leaves; decorative seed capsules. Good cut flowers. Seed pods are interesting in dried arrangements. Adapts to any well-drained soil. CareGrows in most any well-drained soil in full sun. PropagationPlant seeds where they are to grow in mid-spring or fall, sheltering fall-sown plants through the winter.